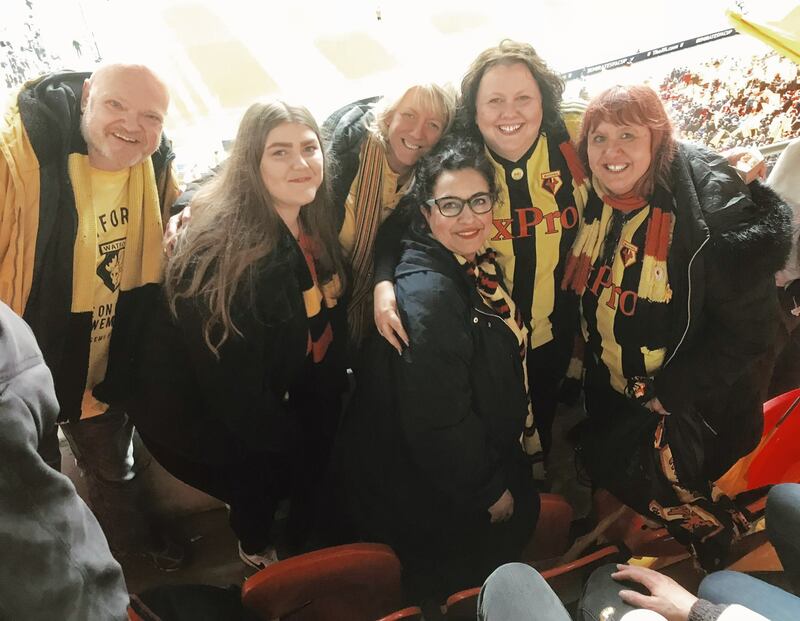 I took an early train to Manchester on which I was delighted to meet up with Dave Messenger, Watford’s Supporter Liaison Officer, who then accompanied me to our designated pre-match pub (which had also been his intended meeting point). On arrival at the pub, I realised that the small bag containing my purse that I had when I left London was no longer on my person. Having had no joy from the customer service hotline, which gave me the number for a closed lost property office, I headed back to Piccadilly. I explained my problem to a lovely guy called Sean in the ticket office, who identified the train manager (Anthony) on the train which had just left to return to London. 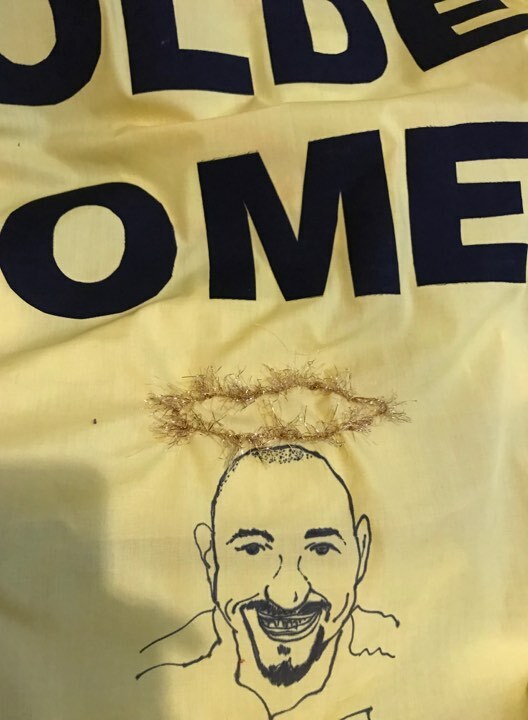 He gave him a call and Anthony went to my seat, found the bag and, as he wouldn’t be back in Manchester until late, promised to leave it at Lost Property in London for me to pick up on my return. Mightily relieved, I headed back to the pub just in time to see the team, who were at the hotel opposite, starting to board the coach for the journey to Old Trafford. I entered the pub to find all the usual suspects in place, which was very convenient as I had semi-final tickets to hand out (thankfully these were in the bag that I had retained). I have to say that it was a relief to pass them on, so that the responsibility was no longer mine. We gave ourselves plenty of time to get to the ground and negotiate the multiple layers of security that they have at Old Trafford. 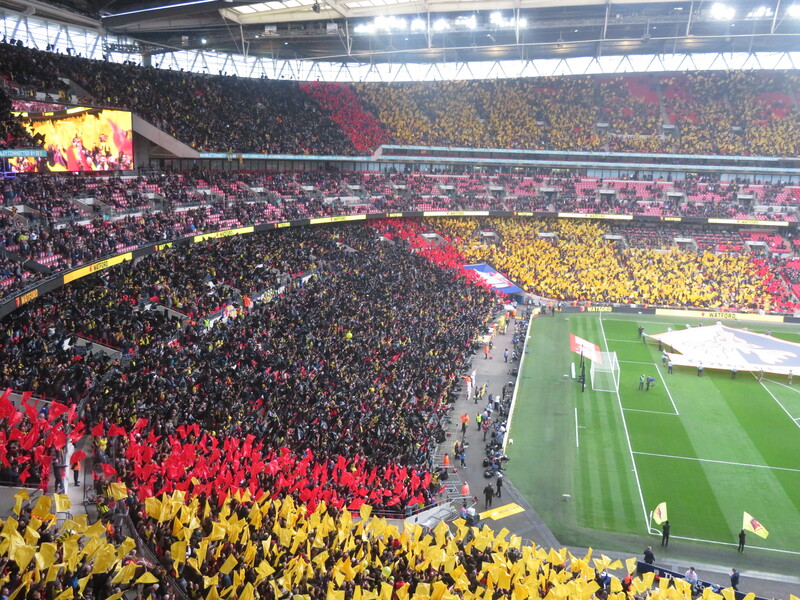 As they now only allow you to take a very small bag into the stadium, I filled my pockets with the stuff I needed for the game (match ticket, glasses, phone, camera, notebook) and left the rest at the bag drop where they charged me £5 for the privilege. I know that they want to encourage people not to take bags to the game, but nobody is going to travel for a couple of hours without provisions for the journey and I find it impossible to travel light anyway. On arrival at the turnstiles, there was another search before we finally entered. Once inside the ground, I could hear the tannoy announcer welcoming us to the “Theatre of Dreams”. My description was much less polite. Old Trafford really is the most unpleasant ground to visit in the Premier League. 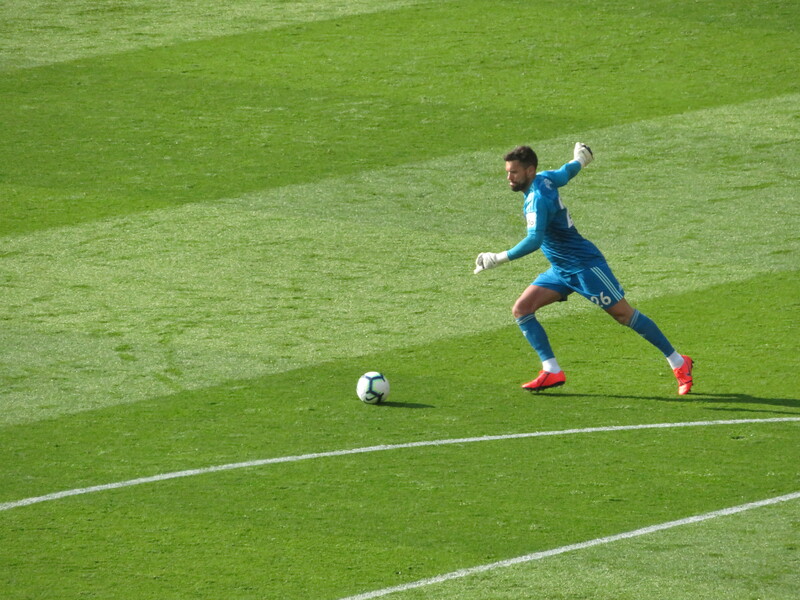 Prior to the match, there had been speculation that Gracia would rest players in preparation for the semi-final next week. There was another train of thought that said that the players had been training for two weeks, so needed game time. 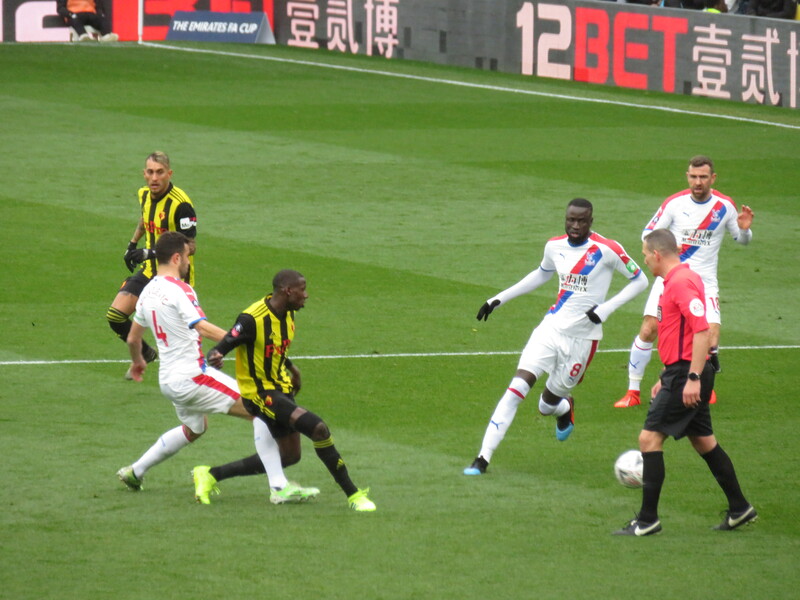 As it turned out, there were five changes from the Palace game with wholesale changes in defence as Foster, Janmaat, Kabasele, Britos and Masina replaced Gomes, Femenía, Mariappa, Cathcart and Holebas. 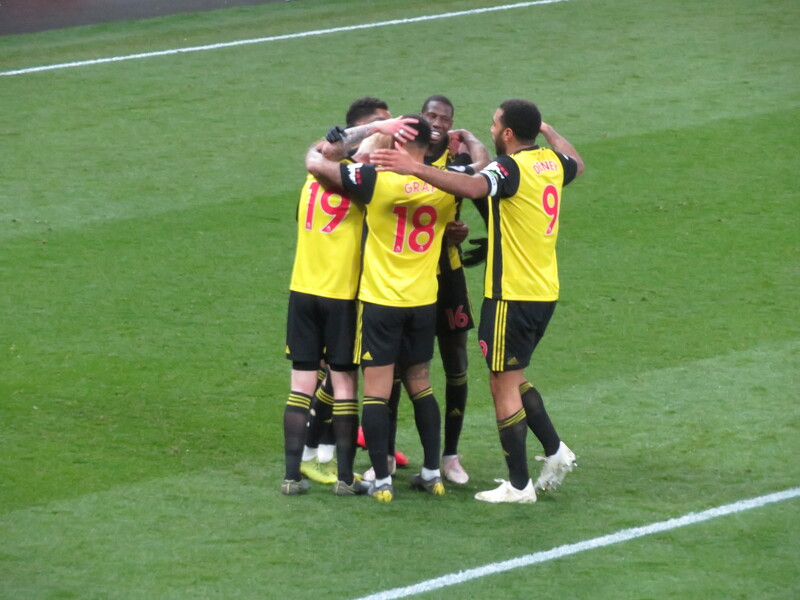 So the starting line-up was Foster; Janmaat, Kabasele, Britos, Masina; Hughes, Doucouré, Capoue, Pereyra; Deulofeu, Deeney. 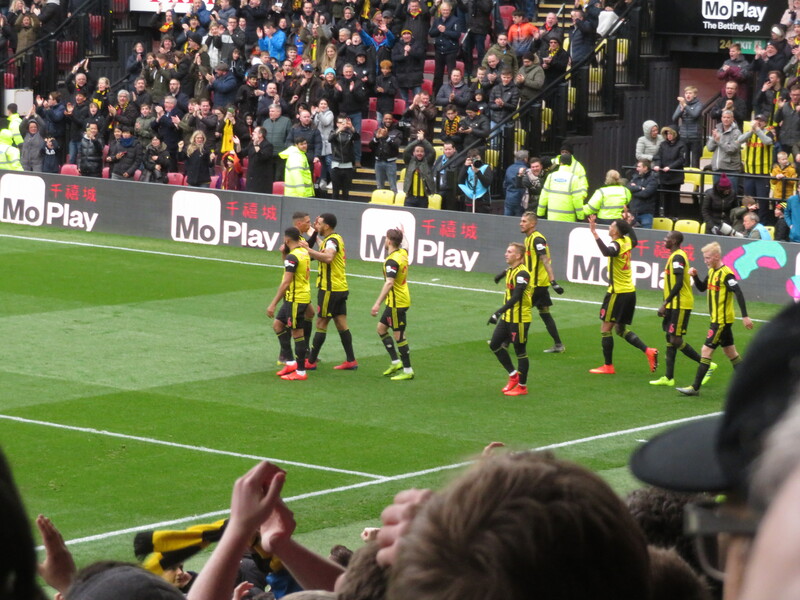 United’s starting line-up featured Watford Academy graduate Ashley Young who, following some over-exuberant goal celebrations in front of Watford fans, is no longer greeted as an erstwhile hero. The referee for the afternoon was Stuart Attwell. 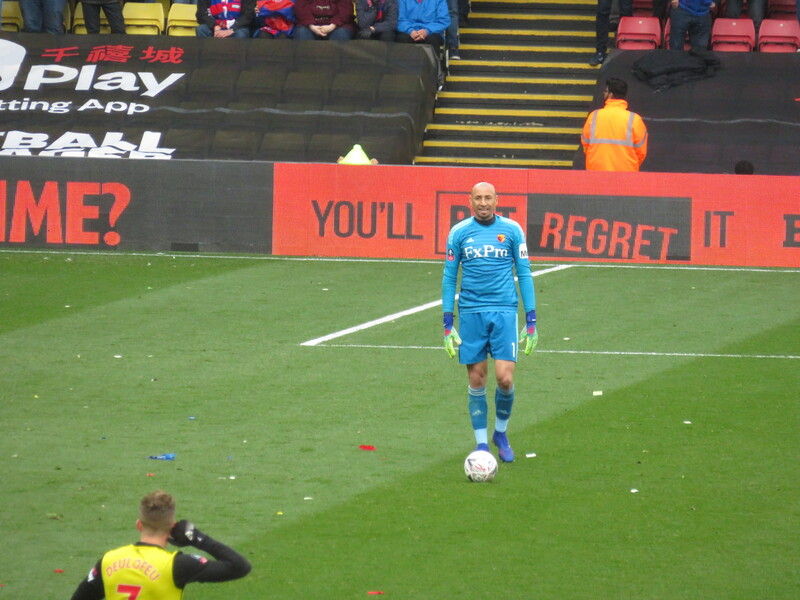 A choice that was rather ironic as discussions with John Eustace regarding the “ghost goal” had been a notable feature at the Tales from the Vicarage event the previous Sunday. 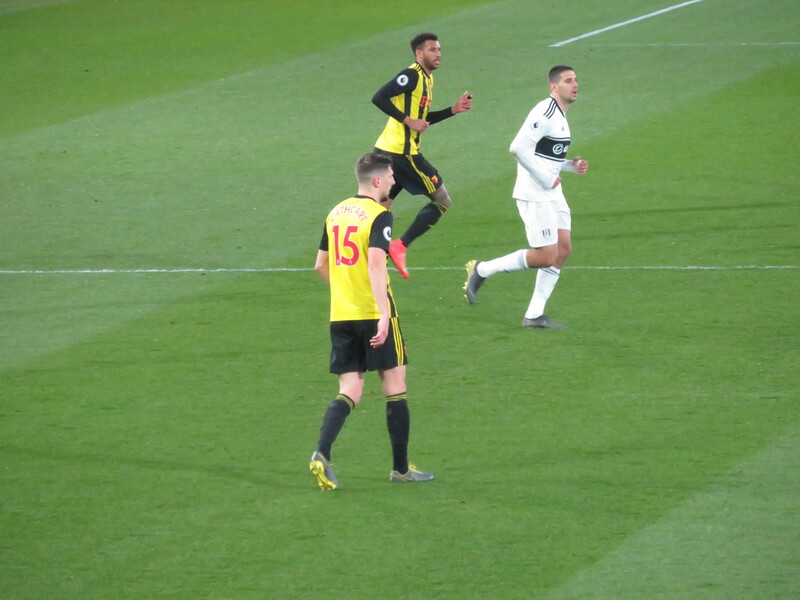 The game started brightly for the Hornets with a decent chance in the sixth minute as Pereyra cut the ball back to Doucouré whose shot was just wide of the near post. 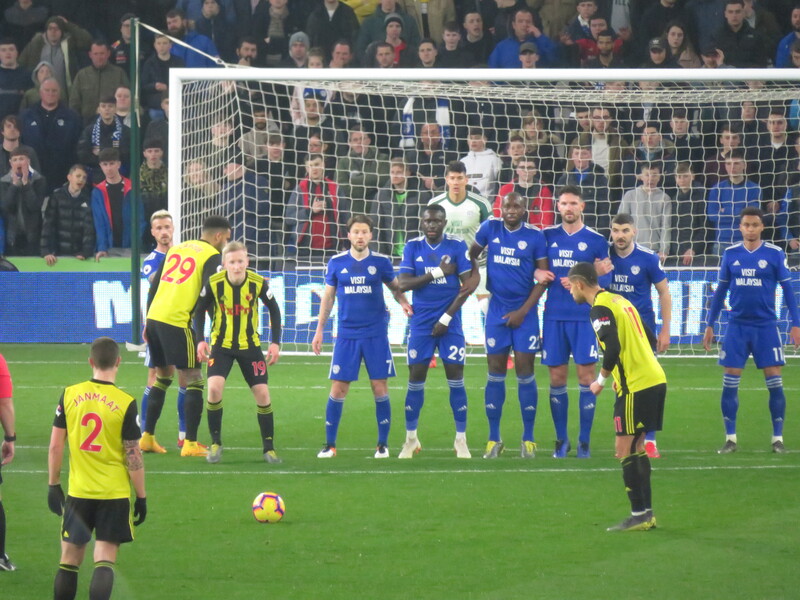 Deeney had the next chance with a shot from distance that was high and wide of the target. The first attack of note by the home side came on the counter as Pogba released Rashford who was stopped by a brilliant tackle from Kabasele. The resulting corner was delivered deep to Smalling who headed wide. 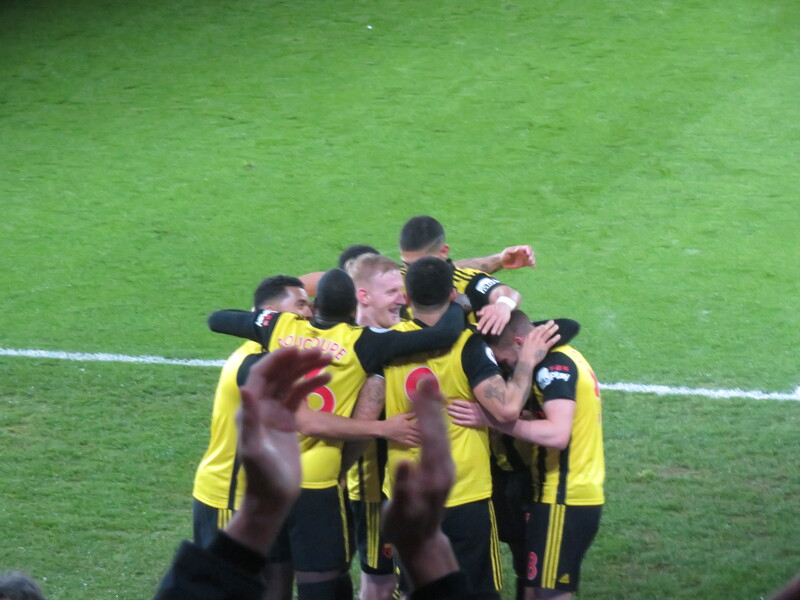 Watford had a great chance to open the scoring as a cross from Janmaat was headed goalwards by Deeney, de Gea managed to make the save but injured himself in the process. At this point the first chant of “Attwell, give us a goal” was heard. The first booking of the game went to Will Hughes for a foul on Pogba. 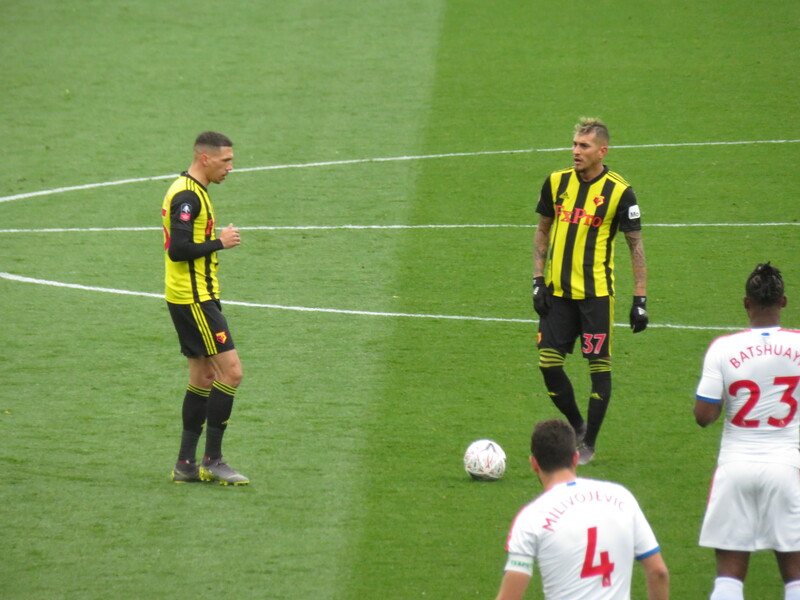 Watford had another great chance and Pereyra really should have done better when he received a headed pass from Deulofeu, but his shot was soft and straight at the keeper. 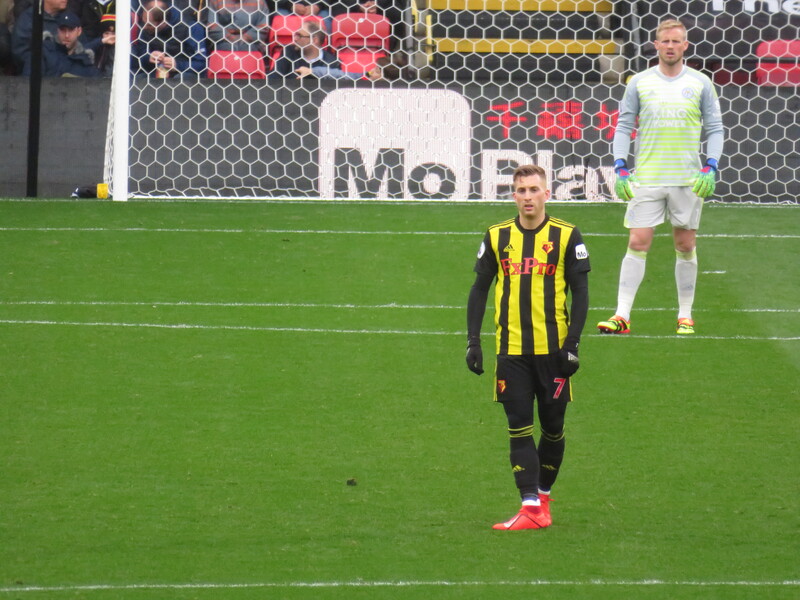 Deulofeu was the next to test de Gea with a shot through legs but, again, it was a fairly simple save for the keeper. 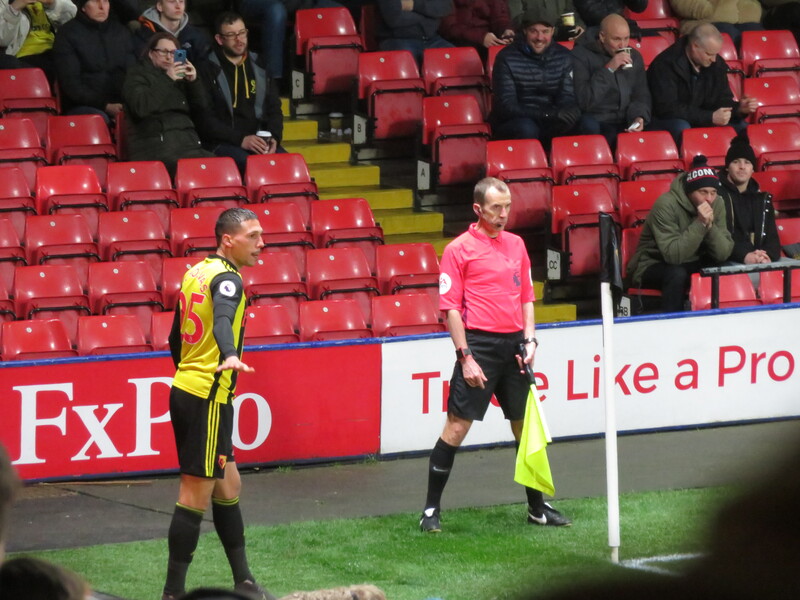 On a rare foray into the Watford box, Martial took a tumble looking for a penalty, but the referee was having none of it and waved play on. 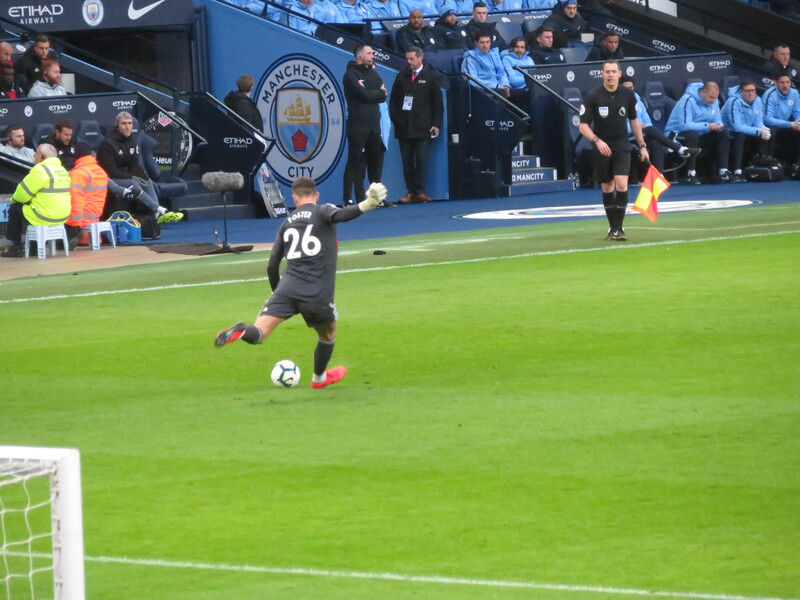 United took the lead against the run of play as Shaw released Rashford, Foster came out to try to stop the shot, but the United youngster found the net. 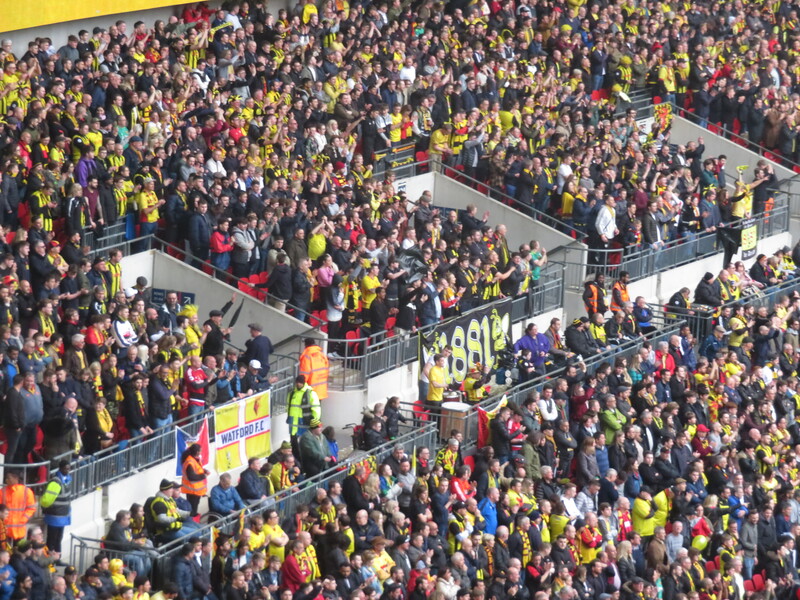 At this point, if there had been any leg room and I hadn’t been in the second to back row of a stand in which everyone was on their feet, I would have slumped into my seat. It was so frustrating to be a goal down following United’s first real chance of the game. 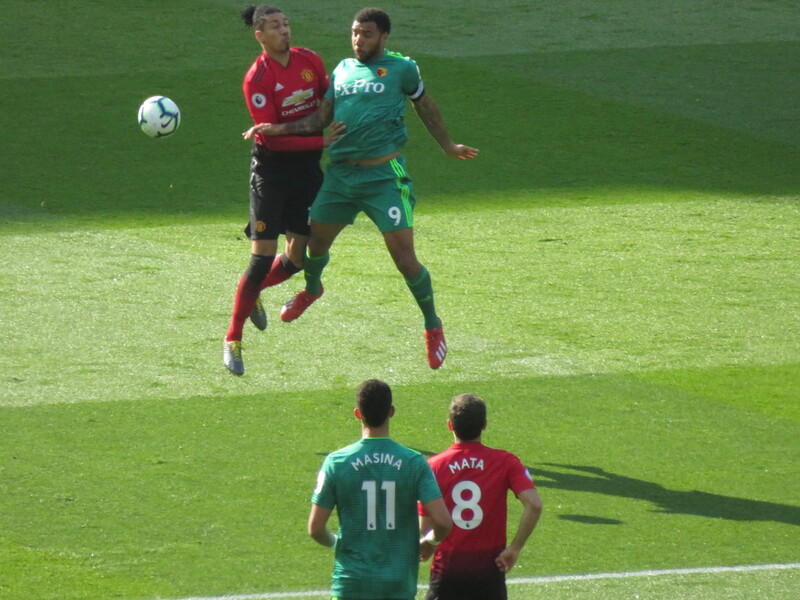 Ironically, the home side had a great chance to increase their lead almost immediately as a corner was cleared only as far as Martial but his shot was stopped by a brilliant reaction save by Foster. 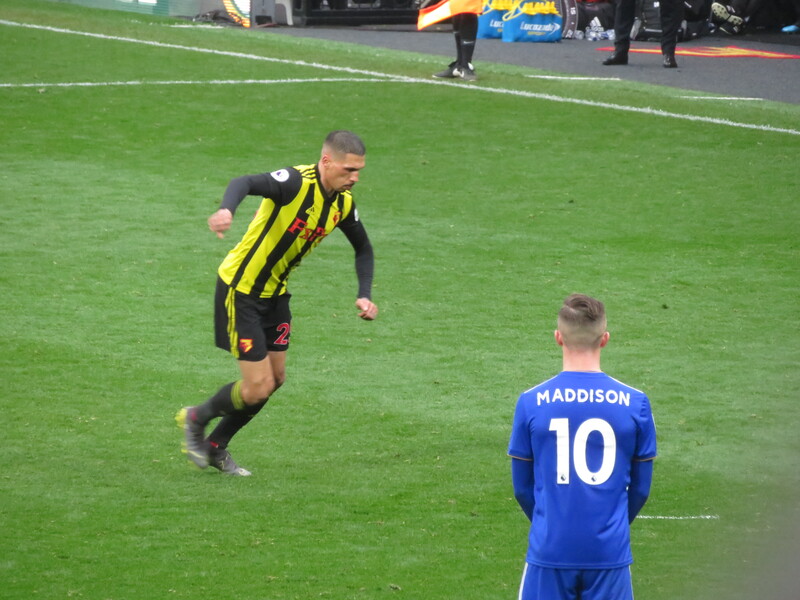 The last chance of the half fell to the Hornets as Deulofeu took a dangerous-looking free kick, but Smalling was able to get a head to it and avert the danger. So we reached half time a goal down in a half that had been completely dominated by the Hornets. We were trailing to a goal scored by the home side on a counter attack. But, if you don’t take your chances …. 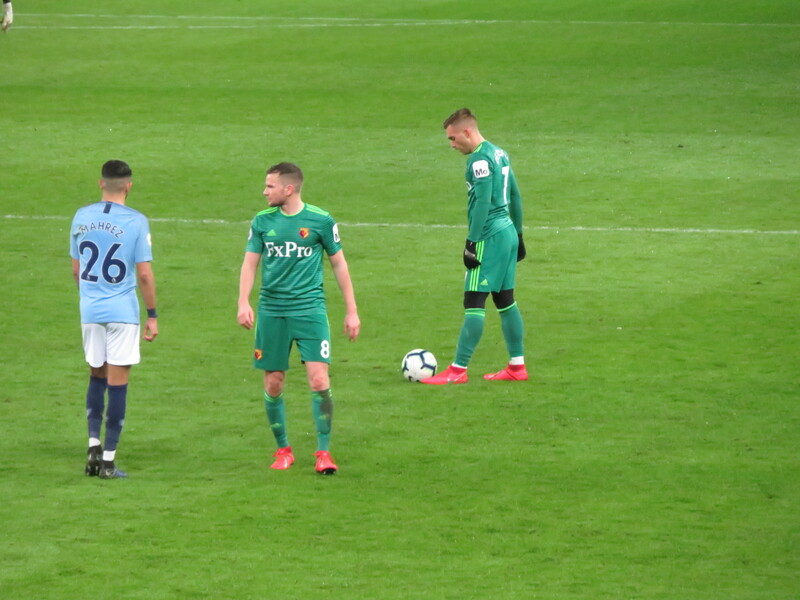 The home side came out for the second half some time before the visitors, but it was the Hornets who had the first shot of the half, a curler from Deulofeu that was saved fairly comfortably by de Gea. Janmaat was the next to try his luck, but his shot from the edge of the box was over the target. 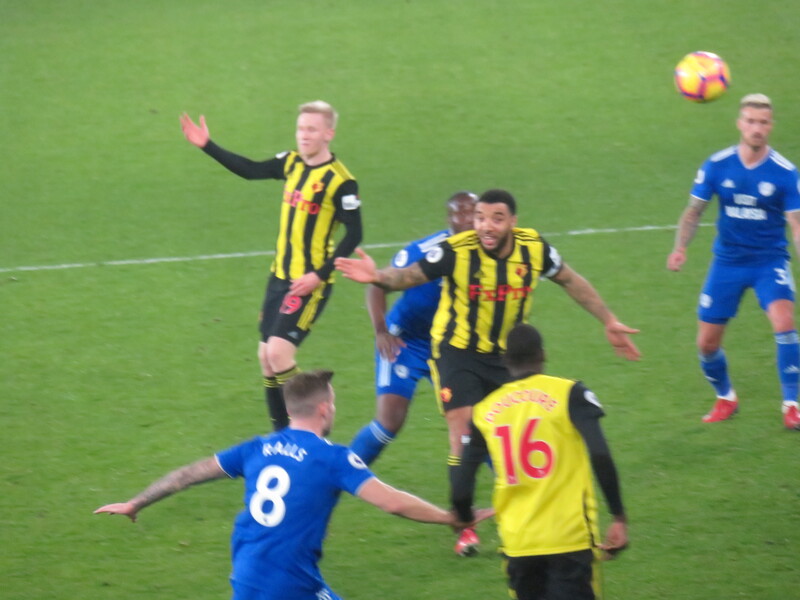 Watford had a great chance to grab an equaliser when Deulofeu cut the ball back to Pereyra whose shot needed an excellent save from de Gea to push it around the post. 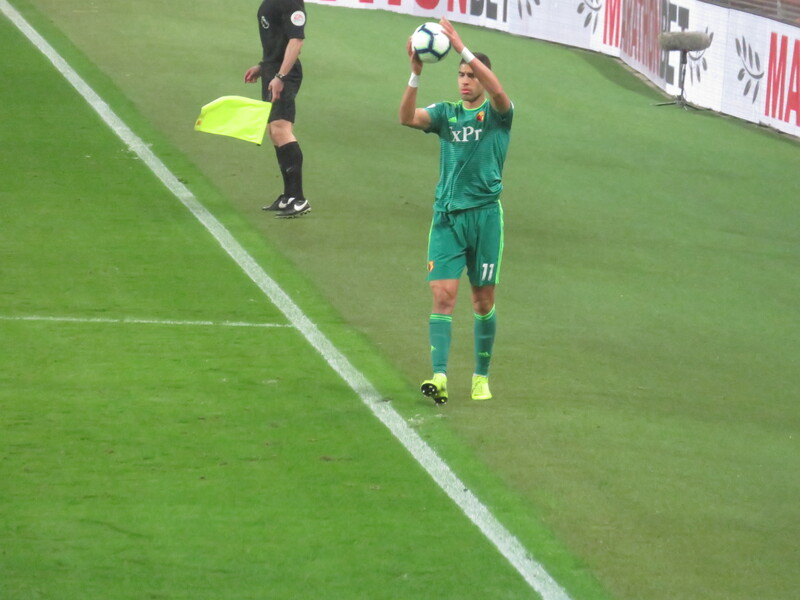 Gracia made his first change after 57 minutes replacing Janmaat with Femenía. 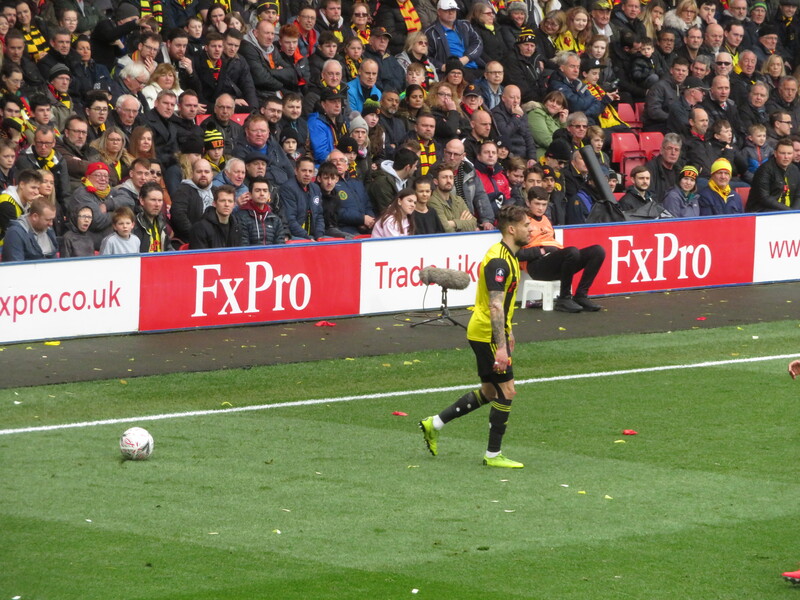 Watford had another decent chance as Hughes hit a lovely curling shot, but it was just wide of the target. 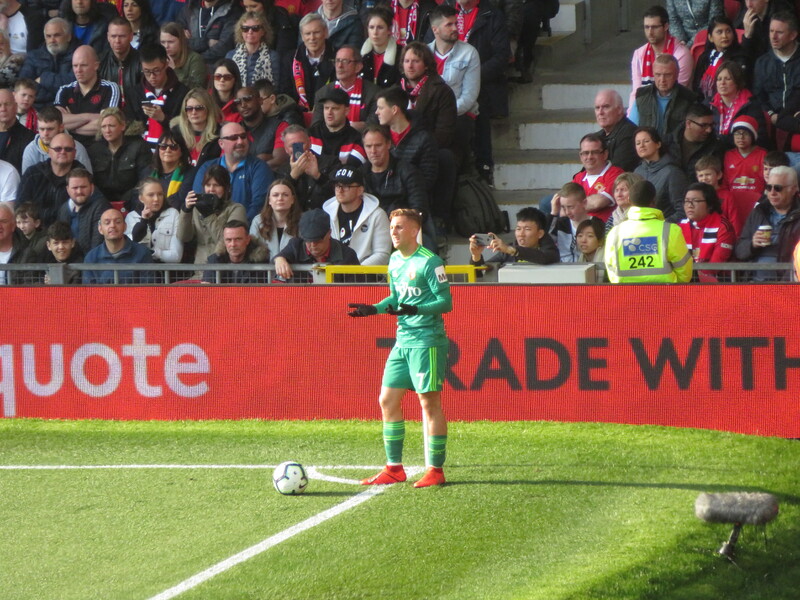 The Hornets threatened again as a corner cleared to Femenía who was well outside the box when he took the shot, but de Gea managed to get in the way to make the block. There was a double substitution for the home side as Herrera and Mata made way for Lingard and Pereira. 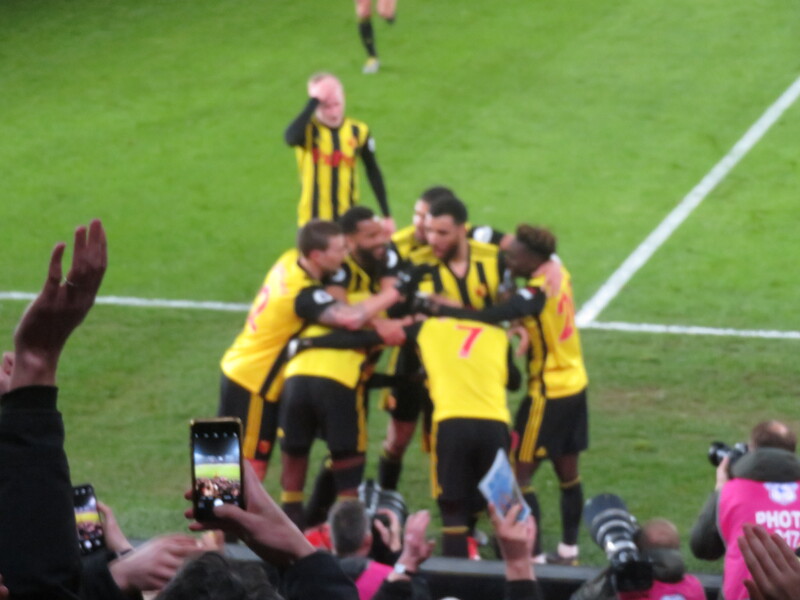 Watford were playing some gorgeous football and deserved more from a lovely passing move that finished with a chip from Deeney that de Gea saved. 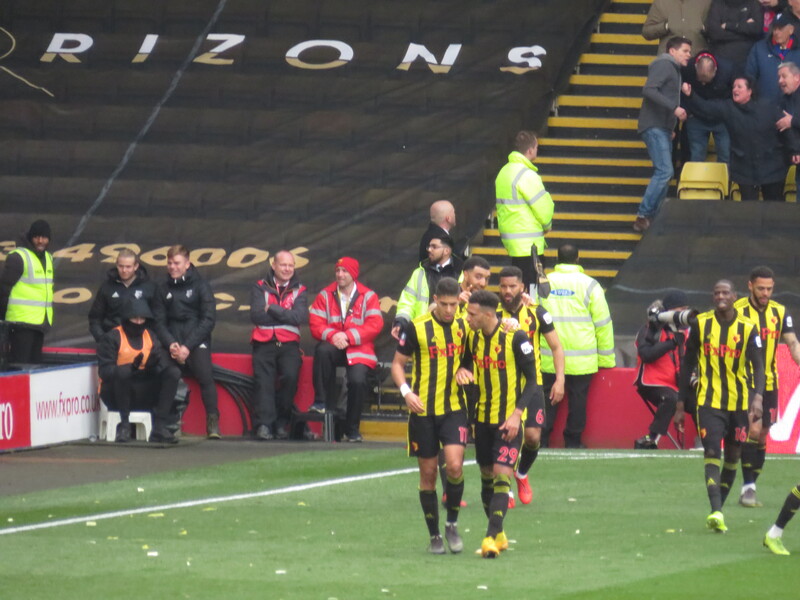 Watford won a free kick, which was cleared to Capoue whose volley was way over the target. 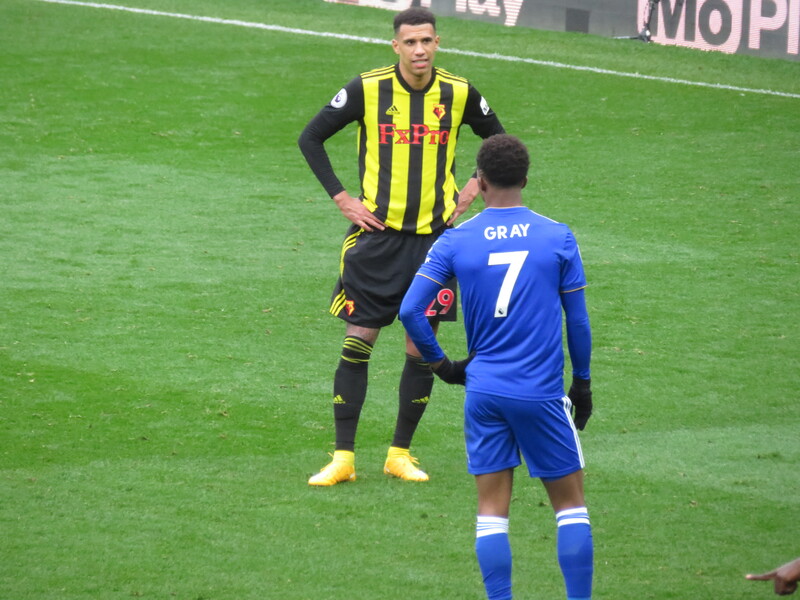 Watford had been dominant again in the second half, so it was cruel that the first meaningful attack of the second half from the home side resulted in their second goal as Lingard crossed for Martial, his first shot was blocked by Foster but he bundled the rebound in. 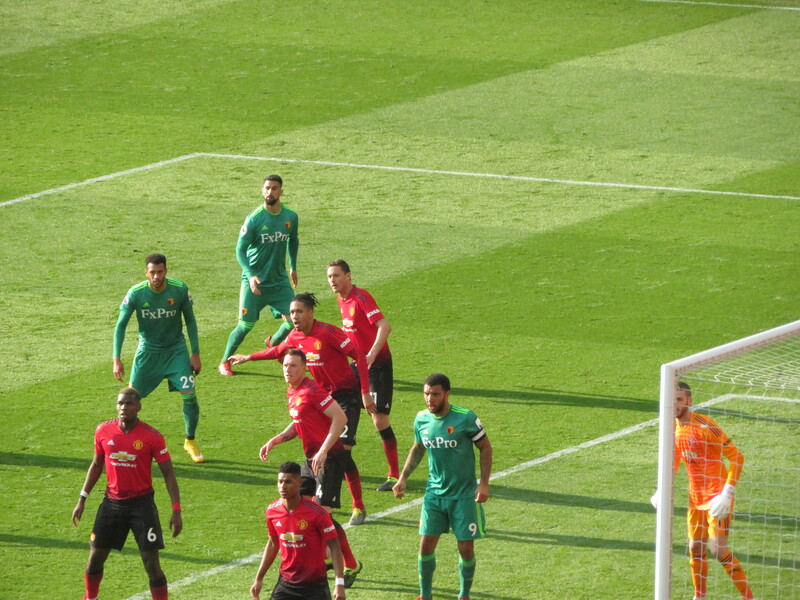 To add insult to injury, we were in front of an executive box so were able to watch a reply which clearly showed Martial in an offside position. 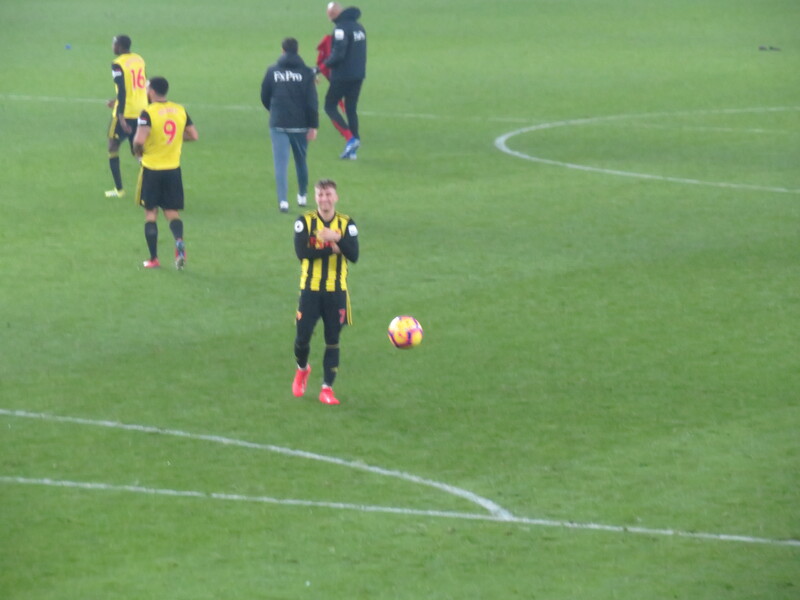 Each side made a further substitution with Gray replacing Deulofeu for the Hornets and Rojo on for Martial for the home side. 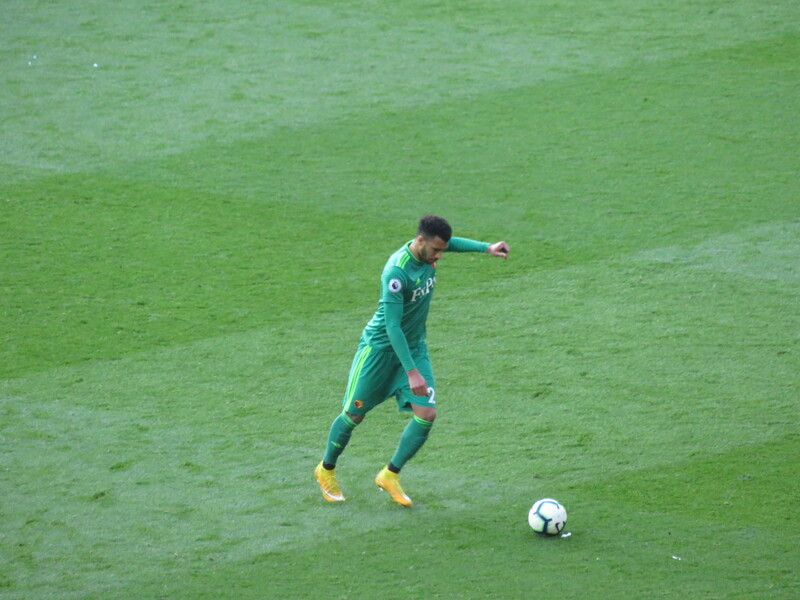 United had a chance to further increase their lead but Lingard’s shot was straight at Foster. 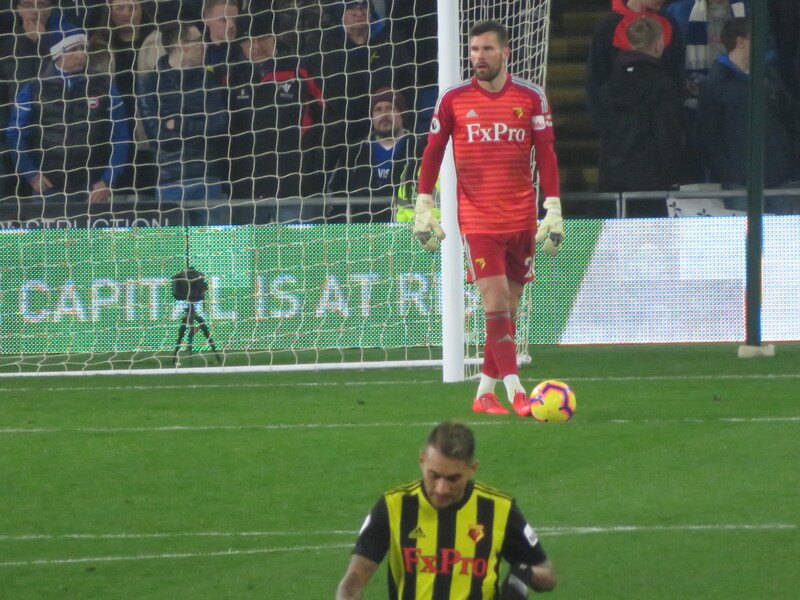 Pereyra then had a great chance to pull one back when he received a cross in an acre of space, but he waited too long to take the shot so was closed down and could only win a corner. 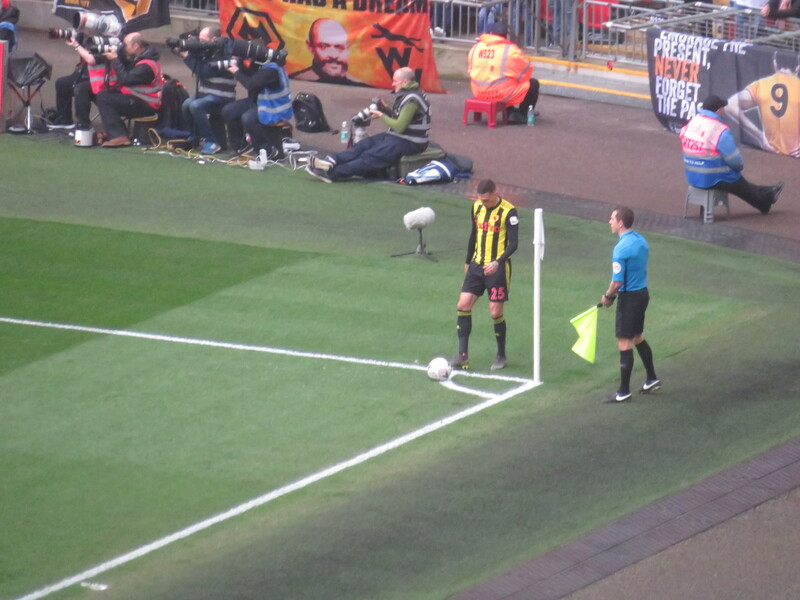 Gracia made his last substitution bringing Success on for Hughes, who had had a superb game. 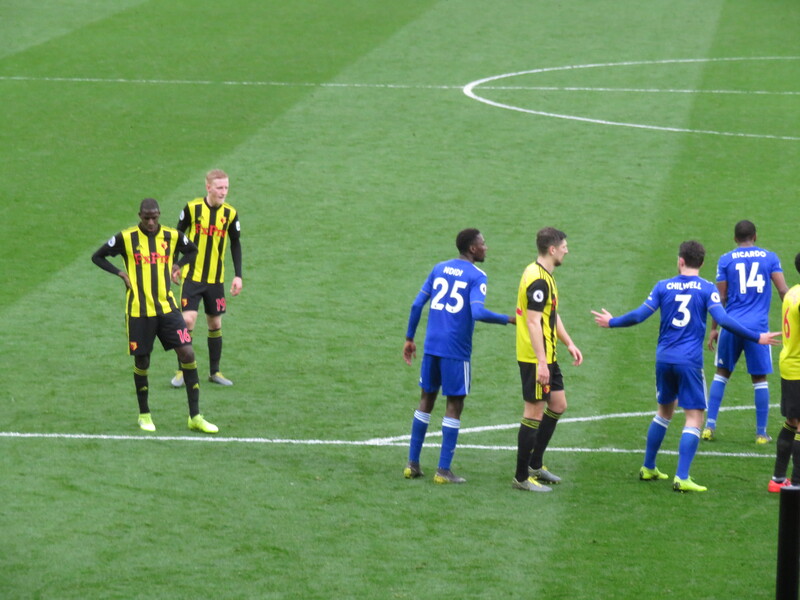 There was a second booking for the Hornets as Masina was cautioned for bundling Rashford over as he attempted a break. 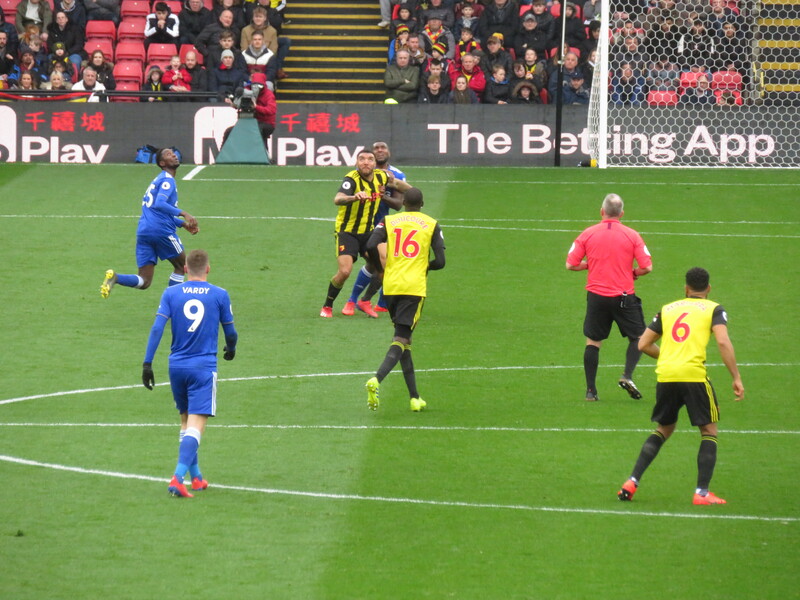 As the clock reached 90 minutes, Watford pulled a goal back as Doucouré played a one-two with Success before coolly finishing past de Gea. 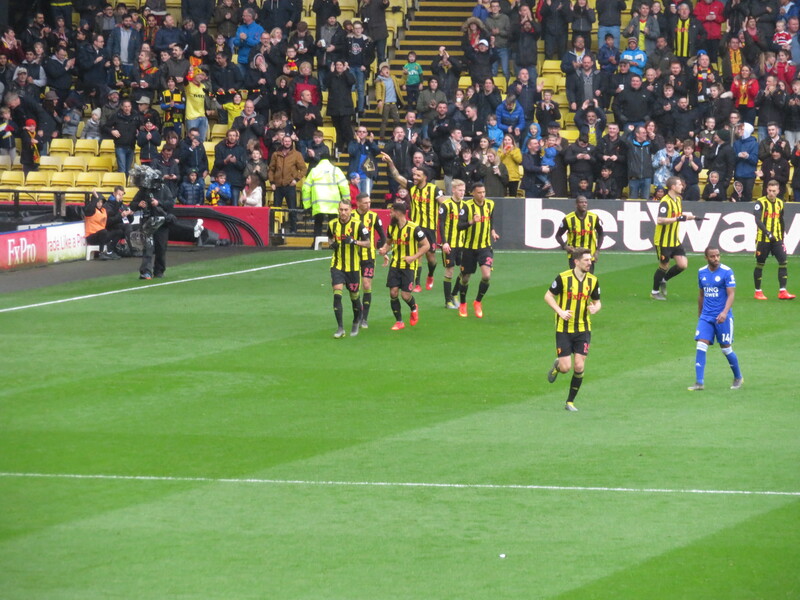 The travelling Hornets celebrated mightily, the players just ran back to the centre circle to get on with the game. Oddly, given the goal, substitutions and various stoppages for injuries/cramp, there was only 3 minutes of time added on. 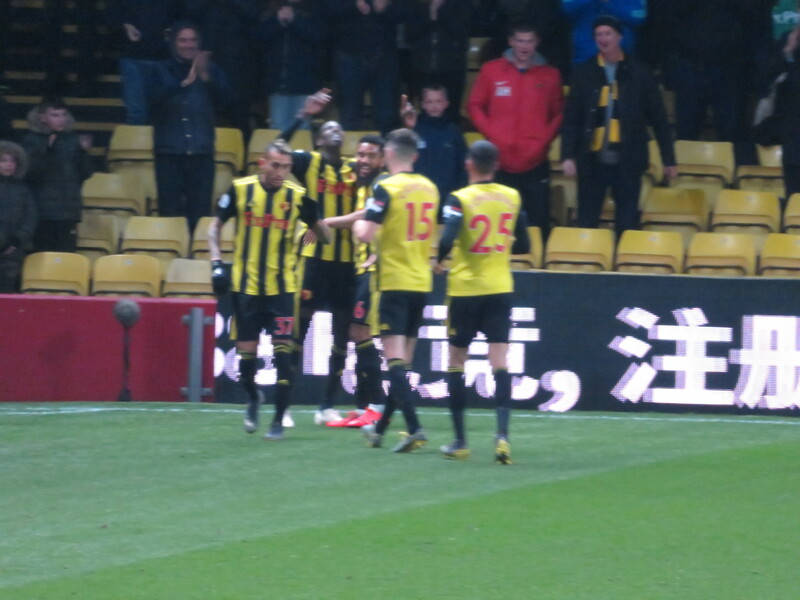 Watford had a great chance to grab an equaliser when Capoue won a free kick just outside the box. 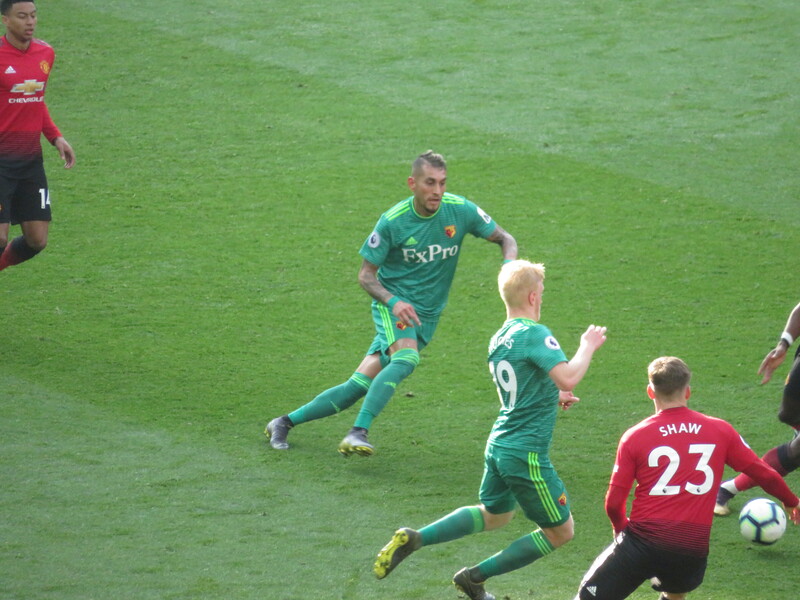 Pereyra took the free kick and I was just waiting for a shot when a United player collapsed in the box and the whistle went to award a free kick to the home side. 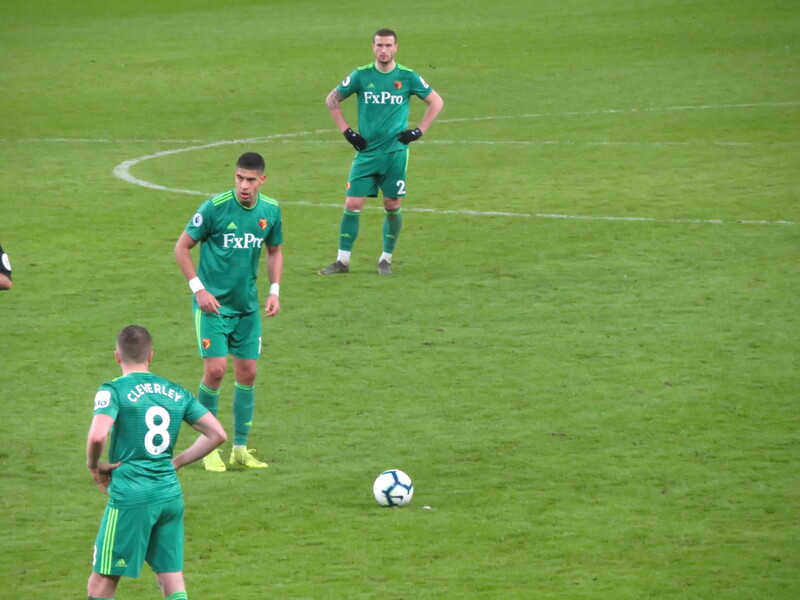 That was the last action of the game, so the Hornets ended up on the losing side. On the tram back to the station, we got talking to some locals who acknowledged that we had been the better team. Unsurprisingly, the train back to London was packed, but I arrived early enough to bump into some fellow regulars, so I had delightful company on the journey home. We were joined by a Norwegian Manchester United fan, who was lovely and chatted away about his team. He had taken his significant other to her first game and said that she’d enjoyed it. 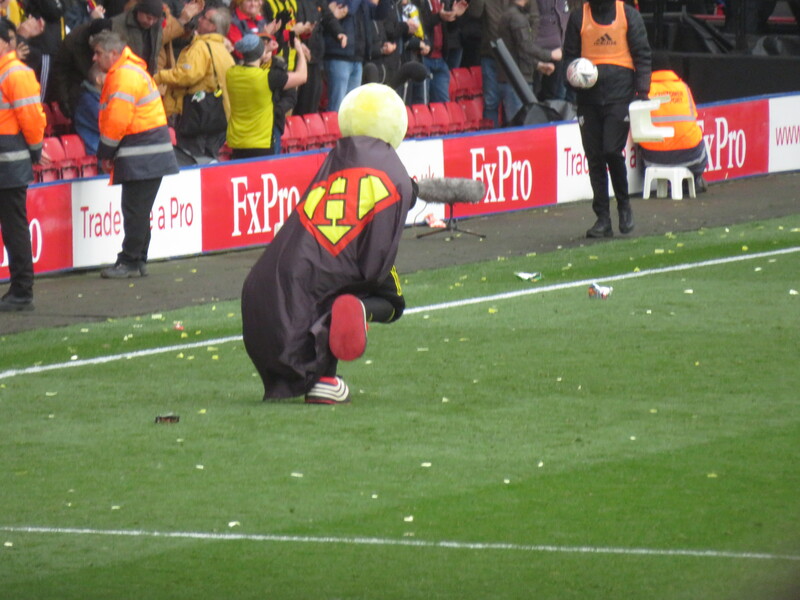 My suggestion that, given the performances of the two teams, she would likely opt for Watford fell on deaf ears. On return to Euston I went in search of my mislaid purse. The guy at Lost Property claimed no knowledge of the item, so I went to the ticket office where I met Petro and Sana, who went above and beyond the call of duty, finding the name and contact details for the train manager who had promised to drop off my bag. They called him and were told that it was in lost property so Petro accompanied me to convey what he had been told to the guardian of the missing loot, who produced a book containing details of all items that had been left with them and I spotted the entry that corresponded to my purse. He retrieved it and I was able to return home with my purse intact and a great respect for the customer service delivered by the Virgin Trains ticket office staff. 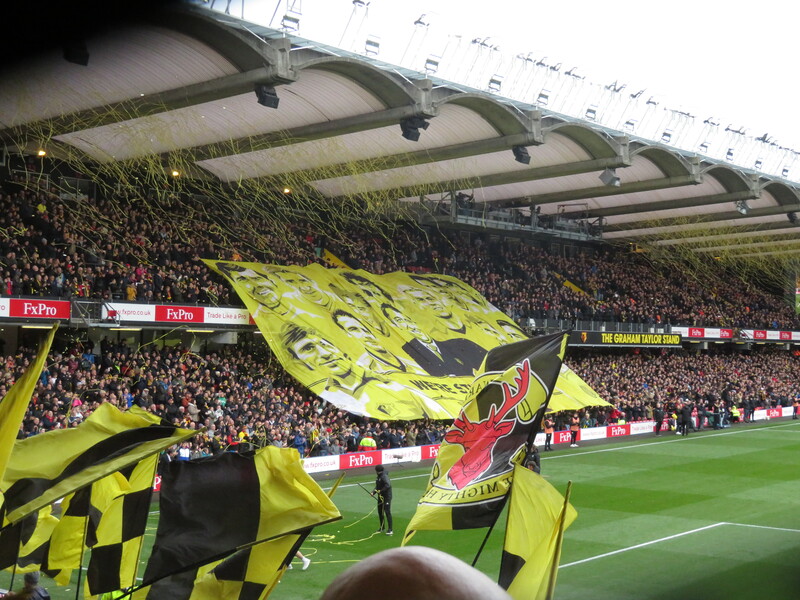 Back to the football and this had been a wonderful performance by the Watford boys. 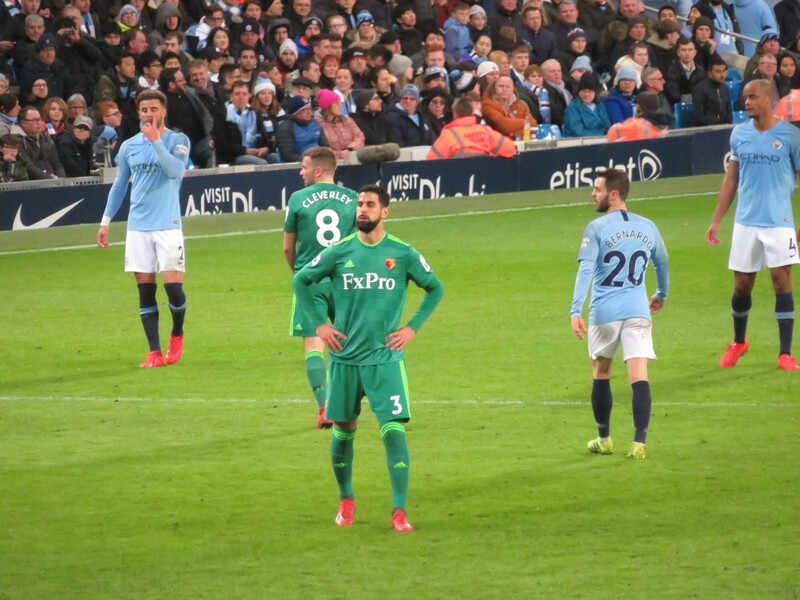 We now face a week with a game against Fulham that could allow us to achieve our highest points total in the Premier League since it was created and a game on Sunday in which we could advance to only our second FA Cup final. If we play as we did on Saturday, I believe we should be able to achieve both of those aims. I just need to work out how to keep myself functioning in the day job for the next week. 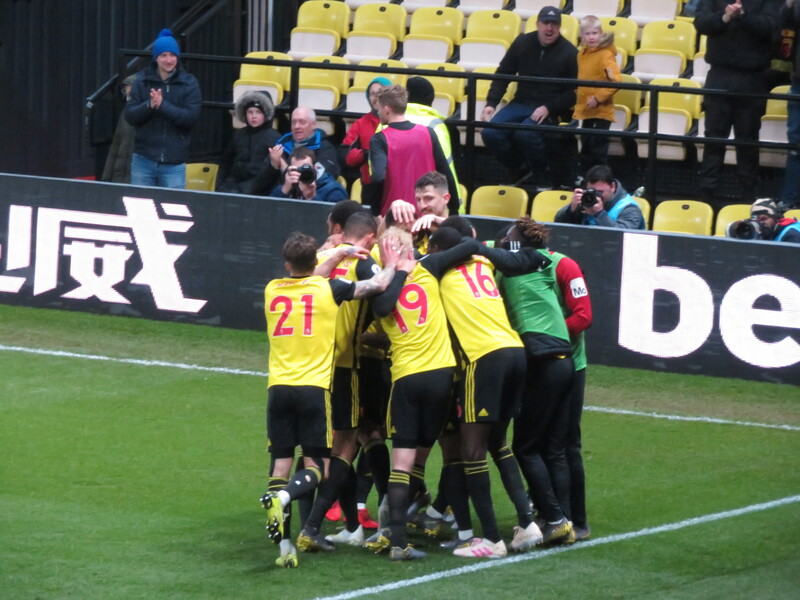 This entry was posted in Watford FC and tagged Abdoulaye Doucoure, Adam Masina, Ander Herrera, Andre Gray, Andreas Pereira, Anthony Martial, Ashley Young, Ben Foster, Chris Smalling, Christian Kabasele, Daryl Janmaat, David de Gea, Etienne Capoue, Gerard Deulofeu, Isaac Success, Javi Gracia, Jesse Lingard, Juan Mata, Kiko Femenia, Luke Shaw, Manchester United FC, Marcos Rojo, Marcus Rashford, Miguel Britos, Nemanja Matic, Ole Gunnar Solskjaer, Paul Pogba, Phil Jones, Roberto Pereyra, Troy Deeney, Watford FC, Will Hughes on March 31, 2019 by franelynn.